1. When will my tickets arrive? Most tickets will arrive within 3-5 working days and should arrive no later than 5 days before the show. If your tickets haven’t arrived a week before the performance, please arrange to collect duplicate tickets at the Box Office by filling in our replacement ticket form here. NB: During our peak period (October – February), performances nearer to the present date will take priority for posting, so if you’ve booked for a performance that doesn’t happen until the new year, your tickets might not get sent out until after this period. If the tickets I've ordered don't arrive in time, do you have a Save The Date print out I can use? If you want to give tickets as a present and are concerned the real ones might not arrive in time, please print off this fun theatre ticket 'Save the Date' invitation. 2. How do I arrange replacement tickets? If your tickets haven’t arrived 5 days before the performance, or if you’ve mislaid your tickets, please fill in our replacement ticket form and duplicate tickets will be printed for you. You can collect these from the venue’s box office on the day of the performance an hour before the show starts. NB: to collect these tickets, the cardholder will need a form of ID or the card they paid with, as well as the booking reference. 3. What do I do if I’m having trouble seeing the seating plan? Best Available Seats option: If you can’t see the seating plan, you can always click on the Best Available Seats option. The website will then make a recommendation for you based on your seating requirements. Download Java or Flash: Alternatively, you can download the latest free versions of Flash. 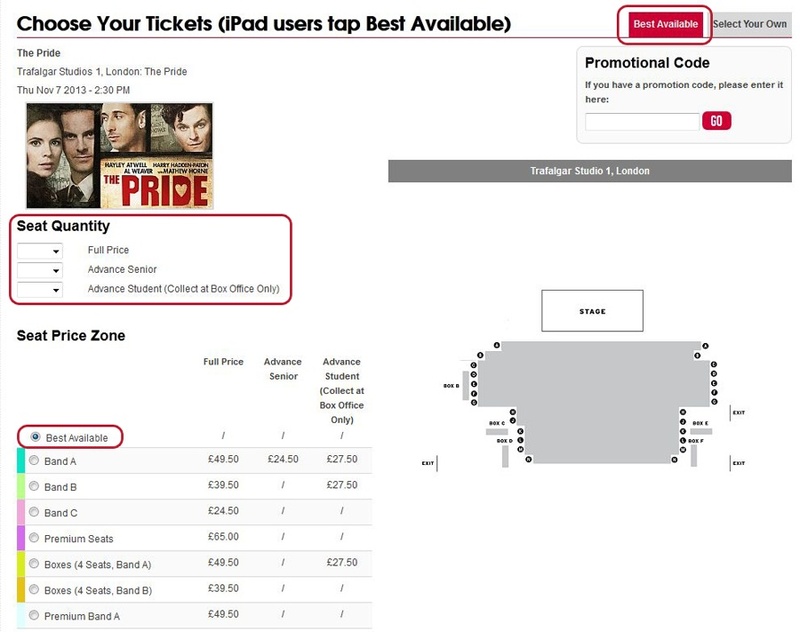 Please note: Wicked in London and The Lion King in London use seating plans that require the latest free version of Java. Java works best in Internet Explorer. 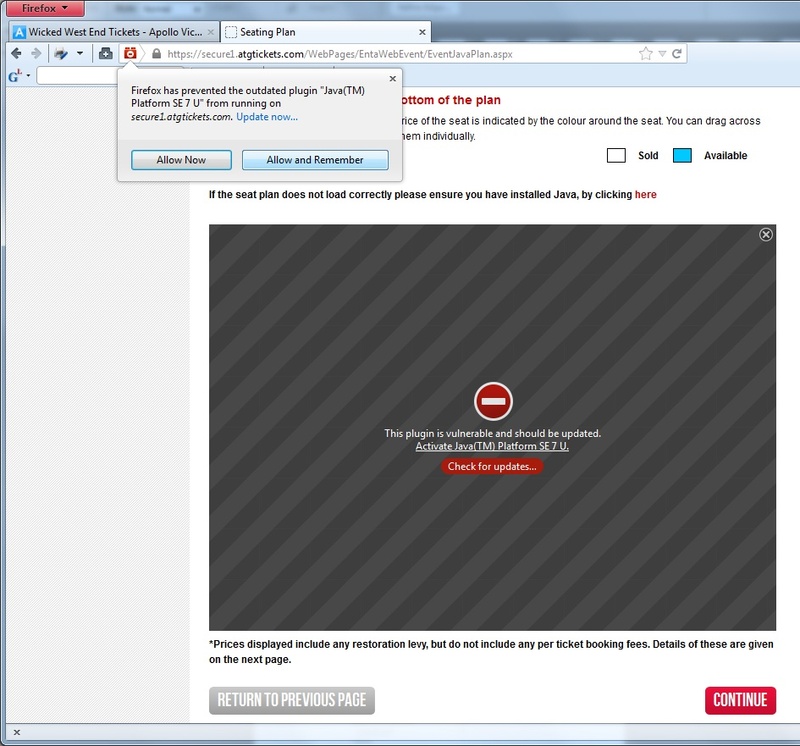 To rectify simply select Allow and Remember in the popup to re-enable Java. Mac users: if you’re a Mac owner, to see the seating plan at its best please use Firefox instead of Safari. Mobile/tablets: We are in the process of developing a mobile friendly website, but in the meantime you can use the ‘Best available seats’ option when you’re using your mobile, iPads, etc. 4. What do I do if I’m having trouble logging in? TIP 1: Your username will be your email address. TIP 2: Your password must contain at least one upper case letter, at least one lower case letter, at least one number and must be at least 7 characters long. Alternatively request a replacement password. Login, register an account, or request a new password here. 5. What should I do if I haven’t received an email confirmation? Wait for a bit: it can take up to 48 hours for an email confirmation to arrive. If you know your reference number and are sure of the date and time of the tickets you booked, you don't need an email confirmation. If your tickets don't arrive 5 days before the performance, the reference number will be enough to get you replacement tickets, which you can organise here. You can login to your account to see if your tickets have been purchased, to find out your reference number, and information about the date and time of performance you booked. If you can’t see any seats saved in your account, it is probably best to ring up on 020 8544 7469 before making any more purchases. To get another email confirmation, please ring up the Customer Call Centre on 020 8544 7469. It's probably worth staying on the line until the email comes through. 6. Why can’t I leave a single seat when I choose my tickets? ATG is committed to ensuring that our performances are as fully attended as possible, both in the interests of our producers and our patrons. Occasionally potential occupancy is compromised if we are left with unsold single seats, and as a business we need to manage the supply of tickets. In the majority of cases our single seat policy doesn’t hinder the ticket purchase process, but there will be instances when the online purchase process will fail, for example when customers are told they cannot buy two tickets because it would leave a single seat. i. Can I exchange my tickets? Subject to availability and an exchange fee, yes you can. Exchanges can be processed by contacting our Customer Services team on 020 8544 7469. Exchanges must be for the same run of the show and at the same venue. Exchanges must be for tickets of the same value or higher. This exchange policy excludes Group bookings: please contact the Groups Department directly by using the Group Bookings enquiry form to discuss your options. ii. If I didn’t book with ATG Tickets, can I still exchange tickets with you? Afraid not, you’ll need to contact the agent you booked through. iii. What happens if my personal situation prevents me from getting to a show? Situations will be assessed on a case by case basis, so please ring us up on 020 8544 7469 (Calls cost 7p per minute, plus your phone company's access charge). iv. What happens if weather issues prevent me from getting to the show? Unless the show is cancelled, our normal exchange policies as outlined here apply. There are no refunds, as outlined in our Terms and Conditions. If you have purchased a Secure My Booking add-on, please see our Secure My Booking T&Cs and website. For claims, please click here. 8. Can I get a refund for my tickets? No, in line with our Terms and Conditions. If you have purchased a Secure My Booking add-on, please see our Secure My Booking T&Cs. For claims, please click here.